Our PHP developers possess the expertize to develop top quality web solutions that can meet all your requirements. We have deployed multifaceted projects through rendering qualitative services to our clients across the world. You can hire a single developer or team of php developers who can dedicatedly work on your needs. Our PHP developer take cares of the malicious attack on websites by coding the website using strong architecture. We are available to render support and maintenance with dedicated team. We have a keen tendency for deploying flexible features in your forum development which will produce W3C affirmed results in personal and corporate forum. PHP comes with comprehensive range of extensions. Our team of developers believes in integrating every new and innovative extension with any assigned project. Our team of developers code websites keeping the complete database support in mind. They make sure that it has non compatability issues with Windows, Solaris, Mac and other web servers. 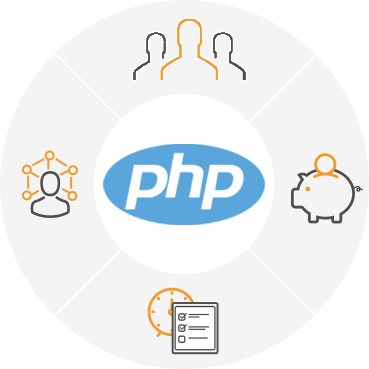 By hiring PHP Web Programmer from IT Chimes you get a Full/Part time PHP Programmer that works exclusively on your projects. The costs depends on the kind of resource you would like to higher and will depend on criterion such as experience, project involved, full/ part time resource. However, we assure to provide you with the best resource that suits your requirement and ensure cost savings of up to 50% of what you will end up paying a resource in your organization. We use tools such as ‘Base Camp’ that allows easy and stress free communication with your resource. We also have dedicated VOIP lines that will help you to be in touch with our team at a time of your convenience. Our Developers handle your project from scratch and maintains requisites which are assigned into PHP web development. Our dedicated team of PHP developers holds knowledge of the changing trends of industry for customized delivery of projects. We have certified developers who utilize their proficiency in developing websites according to the requirements of clients. We have an ingenious and creative mind team members to execute your requirement and ensure zero error. We deliver e-commerce development solutions using updated PHP version for delivering client-oriented solutions. Our team is always ready to deal with complexities related to the development of application in social media through powering it with PHP language.